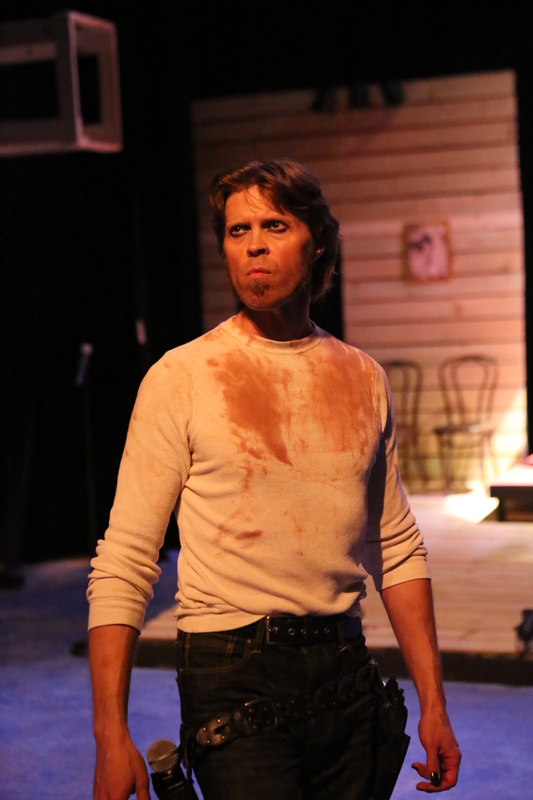 John Sparger shines as “Old Hickory” in New Line Theatre’s production of “Bloody Bloody Andrew Jackson.” Photo credit: Jill Ritter Lindberg. As historical musicals go, this one’s pretty accurate. It tells of Andrew Jackson’s life, his formation of the Democratic Party, his role as a general, then a president along with all the resulting trials and tribulations. 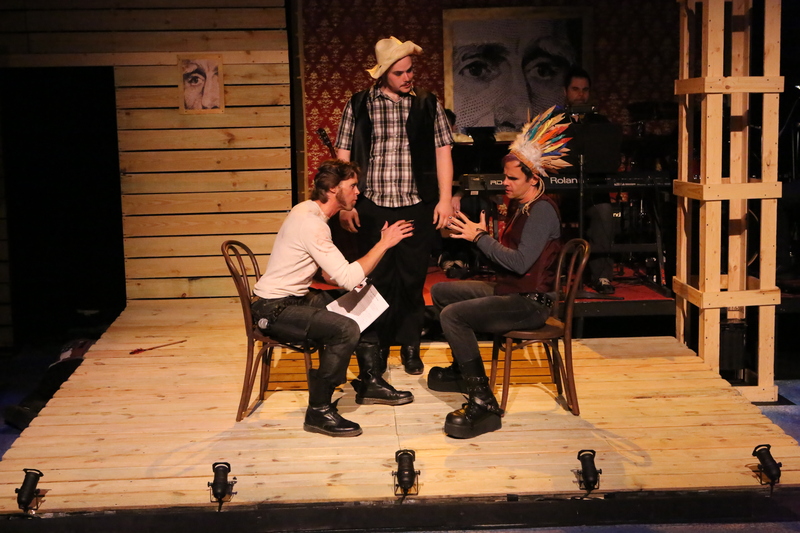 But “Bloody Bloody Andrew Jackson” gives us an irreverent, anachronistic look at the lead characters while also giving us the most entertaining musical look at history since “1776.” Only New Line Theatre could- or would- bring this “in your face” production to us. It’s not your grade school history lesson with adult themes and language peppering the tale of “Old Hickory” and his success with defeating Indians, the British and Spanish in such memorable confrontations as the Battle of New Orleans in his rise to become governor of Florida. From there he loses his first bid for the presidency- despite winning the popular vote- due to machinations within the government who feared his rise to power (losing a presidency in Florida- sound familiar?). Then, four years later in 1828, he wins the election and decides to become a man of the people. Everything goes wrong and when he takes the bull by the horns behind his own convictions, it leads to the infamous “Trail of Tears” and other unpopular decisions that eventually divide his legacy as either one of the best or one of the worst presidents in history. 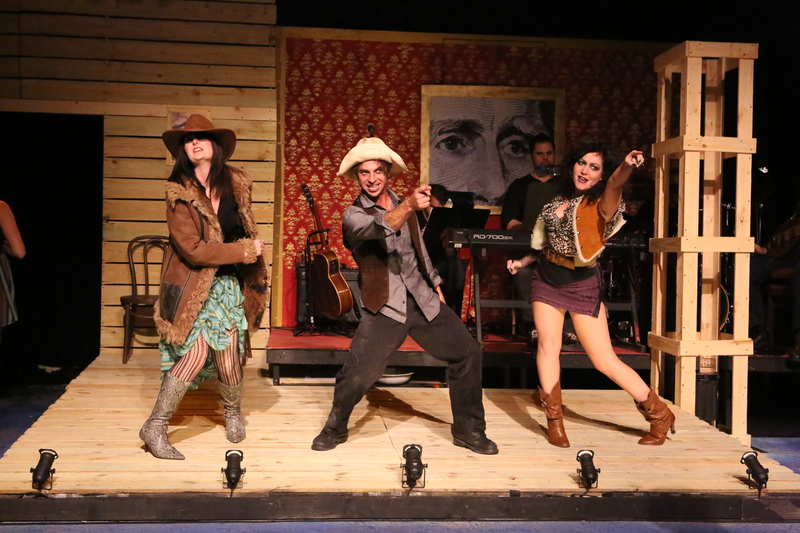 Stephanie Brown, Todd Micali and Sarah Porter spin a yarn during New Line Theatre’s “Bloody Bloody Andrew Jackson.” Photo credit: Jill Ritter Lindberg. John Sparger, as Andrew Jackson, saunters his long, lanky frame on stage in front of the delightful Justin Smolik directed on stage band and immediately gets rude and crude with the audience. We know what kind of night we’re in for. The Alex Timbers script along with the wild and wooly music and lyrics of Michael Friedman take over and we’re on a wild west ride through the Indian problems that Washington doesn’t seem to want to address (told cleverly in an extended number called “Ten Little Indians”). Then Jackson’s injuries, at the hands of the Spanish, being healed by his future wife played with real star power by Taylor Pietz. John Sparger and Brian Claussen attempt to hammer out a treaty for the Indian nation while Zachary Allen Farmer delivers some bad news. Photo credit: Jill Ritter Lindberg. How about a quintet of crooked politicians? Brian Claussen as Martin Van Buren, Mike Dowdy as James Monroe, Zachary Allen Farmer as John Quincy Adams, Nicholas Kelly as Henry Clay (and later as Chief Black Fox) and BC Stands as John Calhoun fit the bill. They all play a multitude of characters as do several other women in the cast including Stephanie Brown, Amy Kelly, Sarah Porter and Chrissy Young. Toss in some great work by Todd Micali and guitarist D. Mike Bauer as the band soloist and you’ve got quite a talented cast that sings, dances and generally misbehaves. 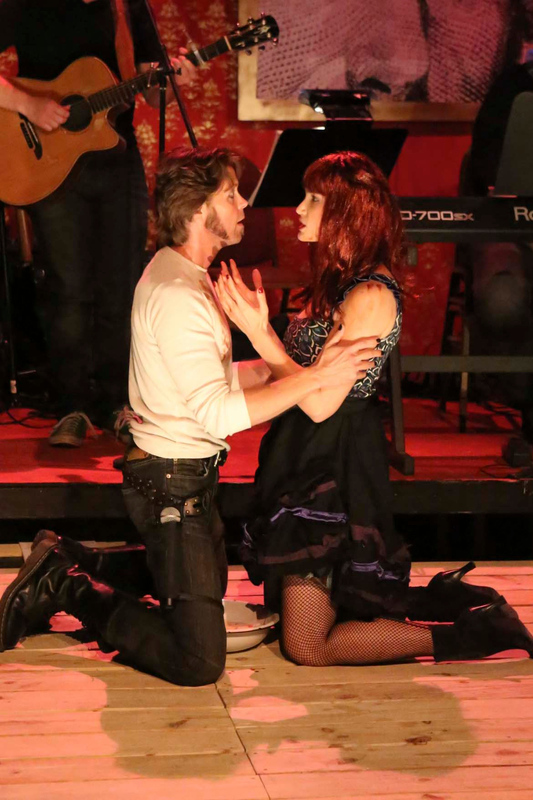 John Sparger as Andrew Jackson and Taylor Pietz as Rachel share a tender moment in “Bloody Bloody Andrew Jackson.” Photo credit: Jill Ritter Lindberg. Cell phones, gyrations that would make a saloon girl blush and a rash of other anachronistic references make this an unreal but highly accurate portrayal of the life of Andrew Jackson. It’s the most fun you’re ever likely to spend with a politician. Director Scott Miller has brought his magic touch into play milking the irony and laughs out of every line, pratfall and stage picture. Nicholas Kelly doubles as fight choreographer while Amy Kelly brings us the wild mix of costumes. Scott L. Schoonover’s set and Kenneth Zinkl’s lights add to the fun and mayhem. If you’re in the mood for a bizarre look at this iconic period in American history, you’re in for a treat with “Bloody Bloody Andrew Jackson.” It should be required viewing for every college American History course. The madness continues through October 20th at New Line’s space at the Washington University South Campus Theatre (formerly CBC High School). Give them a call at 314-534-1111 for info or tickets or contact them at newlinetheatre.com. This entry was posted on September 29, 2012 at 9:43 pm09 and is filed under Uncategorized. You can follow any responses to this entry through the RSS 2.0 feed. You can leave a response, or trackback from your own site. I just wanted to jot down a comment to be able to thank you for all the remarkable ways you are sharing here. My extensive internet lookup has at the end been honored with excellent information to talk about with my companions. I ‘d express that we website visitors actually are very blessed to dwell in a remarkable website with so many marvellous people with insightful tips and hints. I feel pretty fortunate to have encountered your entire web site and look forward to many more fabulous minutes reading here. Thanks once more for a lot of things.